Historical Background. Quetzalcoatl occupied a central place in the pantheon of the Aztec people of central Mexico, but he dates back to a time long before the Aztecs. 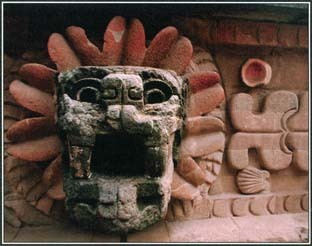 Images of the Feathered Serpent appear on a temple building in Teotihuacán, a Mexican archaeological site from the A . D . 200S. These images are found with images of rain and water, suggesting close ties between Quetzalcoatl and the god of rain and vegetation. QuetzalcoatI, the Aztec god also known as the Feathered Serpent, appears on structures in the ancient city of Teotihuacán in Mexico. See also Aztec Mythology ; Coatlicue ; Huitzilopochtli ; Mayan Mythology ; Tezcatlipoca . “Quetzalcoatl will have knowledge superior to the imagination of even the highest I.Q., because he will explain formula’s involving both DNA + Metabolic Reactions that produce phenomena’s with Visual-Telekinesis with animalia. He will have the knowledge to deliver reincarnation without Death; moreover, he will explain wisdom involving the creation of Gold, that even the Egyptians labored to great extents over thousands of years via their construction with Pyramids to engineer with Alchemy. He will have the right granted by the Creator of the Heavens, to perform miracles in the Ocean so that the theories of time-travel & Einstein will be shown as correct. Moreover, he will grant new lives to paraplegics, by allowing their imaginations and cognitive functions to go hand-and-hand with a flock of Eagles, via the telekinetic circuit of Electrogenesis.